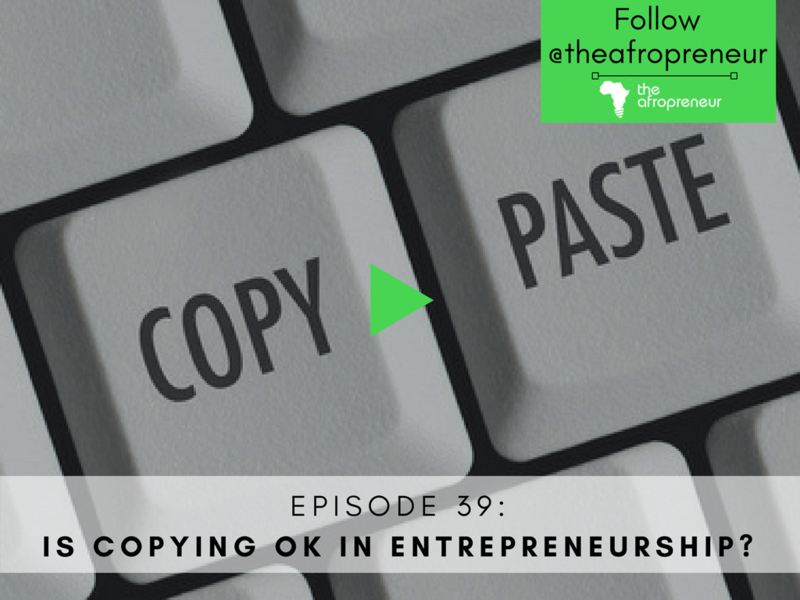 Ep39: Is Copying ok in Entrepreneurship? Last week we discussed some of the lessons we learned at last month’s Startup Grind Lagos meetup and one statement struck us. We thought this was quite profound and decided to discuss it this week. Many successful businesses have been born from copying and many have died as well. Is it morally okay to copy or is copying totally wrong? Is there an unspoken entrepreneurship code that screams: Don’t copy? So many questions and so many takes on the issue. We have taken a stand but we will not reveal that stand in text. You have to listen to the podcast. However, we can tell you this, if you can do without copying, you are a superhero and we think you should go right ahead and show the world. If you decide to copy, you better be great at it else, why did you even bother? Find out our stand on the matter. What do you think? Drop your comments below or send us a message on twitter or Instagram -@theafropreneur (Follow us ;)). In case you missed it, last week we discussed what we learned from Pradeep Palhawani at Start up Grind Lagos‘ Meetup. Listen and share with other entrepreneurs.